Like a string of 65 degree days in February with no snow in sight, the future has continued its early arrival at Citi Field for the New York Mets this August. The Mets traded a combined 18 years of major league experience in the past week with the departures of Jay Bruce and Neil Walker as Dominic Smith joined Amed Rosario in making his major league debut. 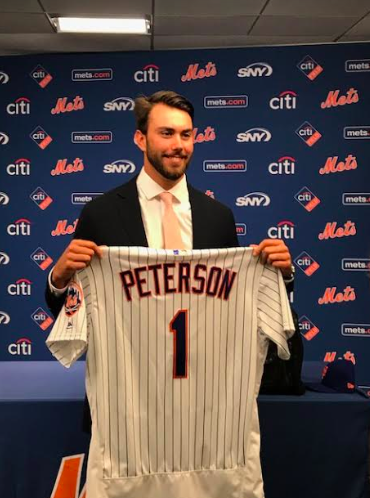 Fans were also treated to an even farther view down the baseball horizon as 2017 first round draft pick, pitcher David Peterson, was formally introduced to the media at Citi Field on August 5, one day after making his professional debut with the Brooklyn Cyclones. Rather than the expected push to the World Series, the last three weeks have seen a series of farewells of the right side of the Mets diamond with departures at first base (Lucas Duda), second base (Walker), rightfield (Bruce), and the closer warming up in the Mets bullpen (Addison Reed). All four players were older pending free agents not in the team’s long-term plans as the Mets seek to retool and replenish a farm system that’s been depleted in recent years. 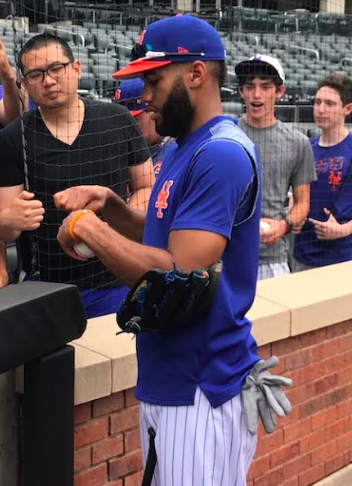 The Mets won in Smith’s debut on the bat his fellow rookie, Amed Rosario, when Rosario’s first career home run in the top of the ninth broke a 6-6 tie. After the game, Rosario said, “Even though I’ve had a bad couple of days, this really helps my confidence.” Indeed, after entering Friday’s game with a .161 average, Rosario has hit in five straight games and lifted his average to .255 in addition to hitting his second career home run, a two-run shot against Aroldis Chapman on Tuesday. Peterson was accompanied by his mother, stepfather, and girlfriend and I had a chance to chat with Peterson and his family prior to the Mets 7-3 loss to the Dodgers. 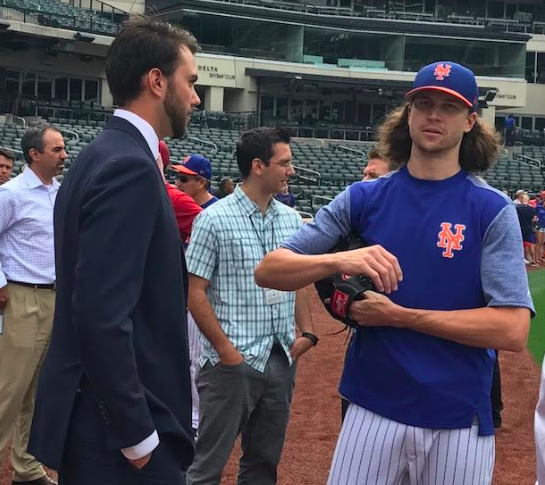 “Brooklyn’s a good place to start,” he said and as he embarked on his first step in the Mets organization with the Brooklyn Cyclones, Peterson said he’d work on his “command and control” and refining his pitches. Born in Denver, Peterson has a tangential connection to Rockland County because his coach at Regis Jesuit High School in Aurora, Colorado was Suffern native and former MLB player and manager, Walt Weiss, who among other things, impressed upon his players to be team focused. 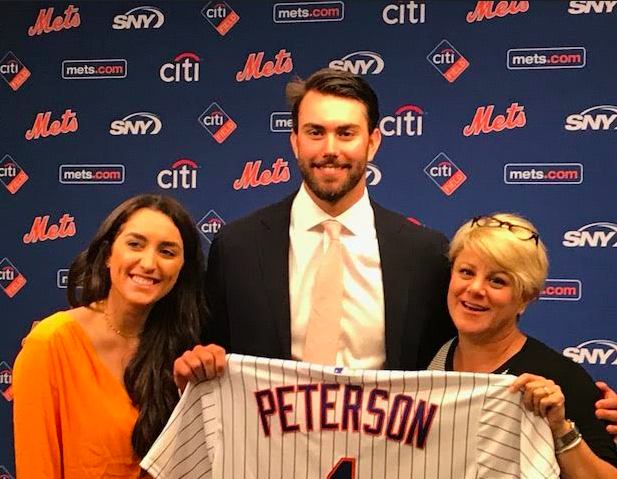 While we watched Peterson meet Mets like Jacob deGrom and Michael Conforto in front of the Mets dugout, as his stepfather Greg spoke in admiration of David’s focus on the team and not himself and even his making the Dean’s List, it wasn’t hard to imagine Peterson pitching at Citi Field someday soon. I invite you to follow me at faninthebox.com and on Twitter at @fanintheboxJoe.